The cherry blossom are in full bloom and it is not raining. That makes for a great first day of spring in the Pacific Northwest. Since I love maps, I thought I’d share some of my favorite outdoor resources for the island. 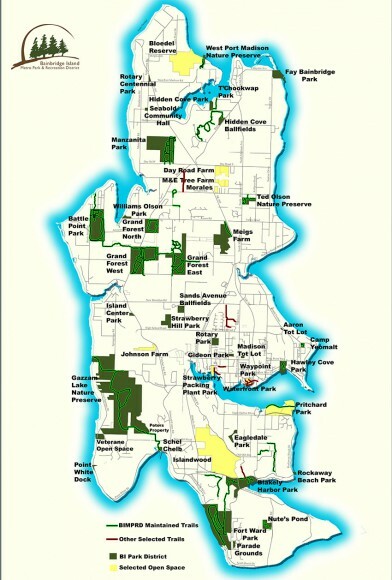 The Bainbridge Island Parks District has a great map of all the island parks – see below. You can also click here for a larger version. Another map I love is the Guide to Walking, Cycling and Paddling Trails. It used to be in print, but now just available online. A third resource is the website Bainbridge Island Trails. You can sign up on the site for new trail updates. A good, resource, with a lot of little known trail options. Another I like, that is also hard to find is the map of the Waterfront Trail Loop in Winslow. Have fun. I’ll see on out there!